Vasant Panchami, or Basant Panchami, is a popular festival in North India which heralds the arrival of the spring season. Vasant Panchami 2019 date is February 10. 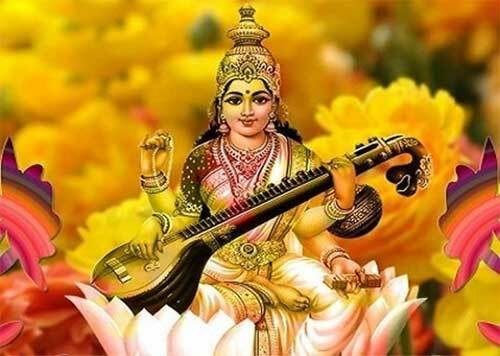 ‘Basant’ or ‘Vasant’ means spring and ‘Panchami’ is the fifth day after Amavasya in Magh month when it is celebrated Saraswathi Pooja is performed in North and Eastern parts of India on the day. Yellow color, which symbolizes prosperity and love, is given importance on the day. Vasant Panchami is essentially a form of nature worship – welcoming the blossoming nature after the harsh winter. Great prominence is given to yellow color on Vasant Panchami as it signifies the ripening of fruits and crops. The mustard fields in North India blooms during this season giving a yellow coat to nature. To welcome the pristine nature after a harsh winter, deities in temples and houses are decorated with yellow colored clothes. Similarly, yellow colored food, sweets and fruits are distributed to friends, neighbors and relatives. Yellow sweet rice is cooked and distributed on the day. Goddess Saraswati is worshipped by students and teachers on the day in northern and eastern parts of India. What to do on Vasant Panchami? People usually wear yellow colored clothes and worship Goddess Saraswati, Lord Surya (Sun God), Mother Ganga (Ganges) and Bhu Devi (Mother Earth). The worship of Sun, Earth and Water (Ganges) is a thanksgiving to the nature for sustaining us. Gods and Goddesses in home are decorated with yellow colored clothes. Yellow colored food and sweets are distributed on the day. Yellow stands for prosperity and love. Children are initiated into the world of learning on this day in some parts of the country. In some parts, worship of the ancestors (Pitr-tarpan) is also performed. Kamdev (God of love) and his consort Rati. The worship of elements in nature is acknowledging the various forms of nature, which sustains human beings, plants and animals. Similarly, people pay homage to the ancestors on the day and Pitru Tarpan is also performed by some communities. Vasant Panchami is also an important bathing day during the Magh Mela. Kite flying is a major activity during the period in many parts of the region.